OnePlus 5T and Oneplus 5 is now receiving a new Oxygen OS 5.0.3 firmware update based on latest Android 8.0 Oreo. In the new update, Oneplus 5 user will get the new face unlock feature. 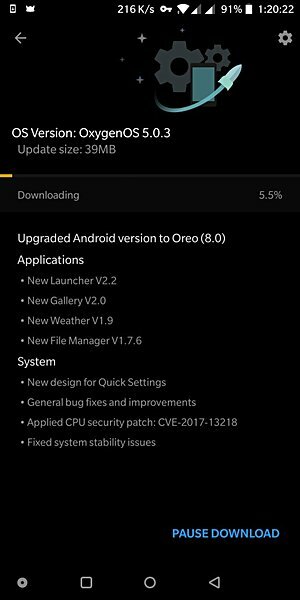 The Oreo update is rolling out with Oxygen OS 5.0.3 and most of the users already got the new Android 8.0 Oreo Oxygen OS 5.0.3 OTA update for OnePlus 5T/5. If you are still waiting for the update then you can use this guide to flash the new Oxygen OS 5.0.3 update on OnePlus 5T/5. The new update comes with Oreo features such as picture-in-picture mode, Notification Dots, Smart Text Selection, and more. For more features, we will discuss it later. This guide is only for the OnePlus 5T/5 user who wants to update their phone with the Android Oreo update. The process wi simple and all you have to download the update zip file on your phone flash the same to apply this OREO update on your Oneplus5T or Oneplus 5. But before that do take the full backup of your phone. Read all the steps very carefully and follow all of the steps one by one on your OnePlus phone. So let’s get started and Update OnePlus 5T/5 to Official OxygenOS 5.0.3 Oreo. This method will work on both rooted and nonrooted oneplus phone. All you need the latest Zip file of OREO ROM flash with the Stock recovery or TWRP recovery. 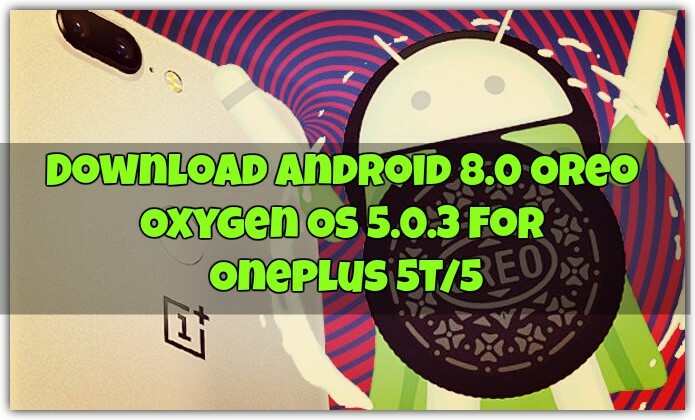 Make sure that the phone has enough battery to flash this Oxygen OS 5.0.3 update. 1. Download the OxygenOS full ROM from the download section and save the ZIP file on your phone. 4. Select upgrade now, and the system would reboot into stock recovery and flash the ROM file. Now your phone will reboot, and your OnePlus 5T/5 is currently running on the latest OxygenOS OREO Update firmware & OS based on Android 8 Oreo. If you are the rooted user, then you have to use the custom TWRP recovery to install this Andriod 8 update on your OPT 5. The process is simple and takes five minutes to complete the whole task. All you have the flash the full ROM zip file of OxygenOS on your phone and you are done. Here is the full guide to installing the official Update on Rooted Oneplus 5. So with this simple guide, you can Download Oreo-based OxygenOS 5.0 Update for OnePlus 5. If you have any question or facing problem during the update, Do let us know that in the comments below.